Note: Since it was abandoned, Hatta Icon is no longer included with Hatta. 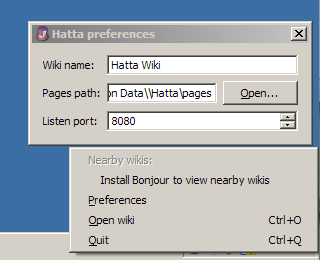 Hatta Icon is an easy, cross-platform (Linux, OS X, Windows) way to run Hatta wiki on desktop machines. It lives in your system tray (usually next to the clock) and gives you the ability to open or quit Hatta just two clicks away. This is the menu of Hatta Icon available after clicking the hat icon in system tray. There is some basic twaking available from the Preferences. The most obvious are the wiki name and should it be announced (be discoverable for other computers in the network using Zeroroconf protocol). 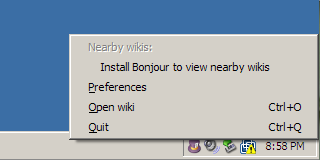 By default Hatta Icon displays nearby discovered wikis and other websites in the top of the context menu, as show below. The highlighted line shows the local wiki being found via Zeroroconf protocol. Sometimes the hat icon is faded — this means, that the wiki is unusable at the moment, due to some undergoing work, i.e. restarting of the wiki server. So that Windows users don't get an impression, that it is a OS X application only, here are corresponding screenshots on Windows.